As it turns out, humans aren’t the only ones with a sweet tooth. According to an article published last week (April 5, 2010) in mBio online microbiology journal, a certain species of fungus, Cryptococcus, were found to thrive and reproduce through consumption of a sugar, inositol, which is commonly found in the human brain and spinal cord. Joseph Heitman, M.D. and Ph.D. and his team of researchers who have been studying Cryptococcus at the Duke Department of Molecular Research believe they have identified a set of almost a dozen genes that code for sugar transport molecules. Sugar transport molecules are important in borrowing sugars from parts of the body to use where they are needed. 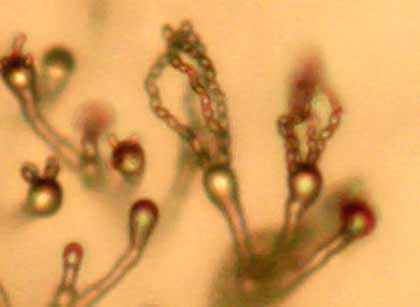 Normal fungi have only two genes that code for these sugar transport molecules. It is therefore hypothesized that because of the increased number of genes coding for sugar transport molecules in Cryptococcus, this fungus is able to more quickly gather sugars to consume. According to Heitman, “Inositol is abundant in the human brain and in the fluid that bathes it (cerebral spinal fluid), which may be why this fungus has a predilection to infect the brain and cause meningitis. It has the machinery to efficiently move sugar molecules inside of its cells and thrive.” Meningitis is a serious health problem that involves the swelling of the area around the brain, causing a build up of fluid, which can have negative effects on brain function. Meningitis is a medical emergency because it occurs quickly and often results in permanent brain damage or death. Before it was able to infect the brain, it is believed that Cryptococcus originally localized itself on plants. Plants are rich in inositol and most likely caused Cryptococcus to adapt and change its genome to produce more sugar transport molecules in order to survive and replicate. Because the brain and spinal cord naturally have very high concentrations of inositol it makes sense that Cryptococcus would target the brain as a niche. Furthermore, it has been found that inositol stimulates sexual reproduction in Cryptococcus, so in areas of plentiful inositol concentrations, such as the brain, reproduction occurs often and rapidly. While Cryptococcus’ love for sugar may seem only beneficial, it turns out that because the fungus relies so heavily on inositol for nutrition, scientists have found a way to essentially put the fungus on an “Atkin’s-esque low-carb diet”. This “diet” would greatly reduce the ability of Cryptococcus to multiply, thus lessening its effects on the human brain. Check out mBio online microbiology journal for more articles and other information on this research.